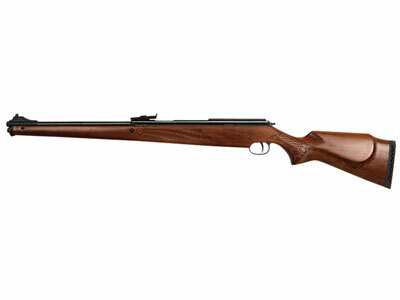 Your Diana 430 Stutzen air rifle will deliver years of faithful service. Diana rifles are made in Germany and will stand up to regular use. This model is the successor to the classic Diana 46 Stutzen. If you like accurate sporting rifles -- get a Diana. If you like beautiful wood and deep, rich bluing -- get a Diana. If you like a dependable gun -- get a Diana. Germany has long been acknowledged as the airgun industry leader. And that's why Diana guns have a faithful international following of hunters, plinkers and field target shooters. To get the most accuracy from your Diana 430 Stutzen air rifle, mount a good quality scope. What is the main design for this air rifle model 430 stutzen? what is the main design for this air rifle 430 Stutzen?